Since meteor showers are a favorite of sky watchers worldwide, viewers in North America are in for a treat – weather permitting!- around August 10 – 12th. The annual Perseid (“Purr-see-yid”) Meteor Shower will occur as the earth passes through the remnants of Comet Swift-Tuttle. The Perseid meteors got their name because the point in the sky they appear to come from, also known as the radiant, lies within the constellation Perseus. The meteors are the debris in the tail of the comet Swift-Tuttle, which got its name from the two American astronomers who independently (as often happens with comets) discovered it in the 1860s. Swift-Tuttle was later “rediscovered” (as also often happens with comets) in 1992. Historians have traced Swift-Tuttle’s orbit around the sun back nearly 2,000 years, and it’s believed that the comet was observed in 188 A.D. and possibly as early as 69 B.C. Because Swift-Tuttle has a very long orbit, the comet won’t pass close to Earth again soon. However, the pass that will happen in 2126 is predicted to be spectacular, so be sure to have your great-grandchildren mark their calendars! Certain things can interfere with the viewing of meteor showers. Two of the big ones are moonlight and light pollution. The moonlight won’t be an issue during this year’s Perseids; the moon will be new on August 10th and will set soon after sunset for the days of the meteors. However, there’s not much you can do about light pollution except finding a site with suitably “dark skies;” that is, an area far (or as far as possible) from cities, industrial plants, airports, etc. If you live near Fort Collins, two of the city’s Natural Areas will be hosting meteor shower-watching programs: from 7:45 pm to 11:00 pm on Thursday, August 12th at Bobcat Ridge Natural Area and from 7:45 pm to 11:00 pm on Friday, August 13th at Soapstone Prairie Natural Area. Visit the Natural Area’s website for more details and registration information. Once you’ve got a dark skies site already picked out, the next step is determining where to look. Locating Perseus isn’t difficult. The constellation isn’t the brightest in our night sky, but it’s located just “below” a bright and distinctive constellation, Cassiopeia (“Cass-ee-O-pea-yah,” or “Cass-ee-o-PAY-yuh,” your choice). First, locate when and where the sun sets from your viewing location; your local newspaper will have sunset information. Then, stand with the sunset on your left shoulder. The sun sets in the northwest at this time of year. If northwest is on your left shoulder, then you’re facing northeast. Establish some landmarks – a tree, etc. – to remind you which way northeast is. Once it gets sufficiently dark (about an hour after sunset), go outside and face northeast. Cassiopeia will be low in the northeast and rising. Along with the Big Dipper and Orion, Cassiopeia is one of the most easily recognized constellations in the northern hemisphere, for at this time of year it resembles a raggedly-drawn letter “W.” Perseus is just “below” Cassiopeia. Once Cassiopeia has risen so that it’s well over the trees and rooftops, look below it so see a small magician’s-hat shape of stars. That’s the head of Perseus, and the rest of the constellation will follow! A comfortable chair. Preferably one with a place to rest your head. Bug spray. This won’t be like viewing the Leonid meteor shower in November; the mosquitoes still will be out unless it gets cold, in which case having some sweatshirts or jackets is a good idea. Patience. You should sit and face the shower’s radiant, the place in the sky where the meteors appear to come from. Facing Cassiopeia is close enough. And then you have to wait: maybe a long time, maybe not. Keep your eyes relaxed – you never know when or where you might see a meteor. While still in space, the debris from Swift-Tuttle are called meteoroids. These meteoroids are fast, entering the Earth’s atmosphere (at which point we start calling them meteors) at 70 kilometers/second (slightly faster than 45 miles/second). Most of the meteors are the size of a grain of sand, but some can be as big as a marble. Once in the Earth’s atmosphere, the meteors heat up, reaching more than 3,000 degrees Fahrenheit (1,650 degrees Celsius). Most meteors vaporize in the extreme heat, creating what we call shooting stars. Any meteors that do reach the Earth’s surface before being completely burnt up are called meteorites. While you’re meteor-spotting, treat yourself to some other sights of the night sky. You might have to refer to a constellation chart for these, so it would be wise to do your reviewing before you leave the house. Using your NW-NE reference, face halfway between those directions and you’ll be facing north. The “Big Dipper,” everybody’s favorite group of stars in the northern hemisphere, will be high in the NW (your upper left) and swinging down towards the horizon. Our “Home” galaxy, the “Milky Way,” will be passing immediately overhead. If you’ve never seen the Milky Way – and may people haven’t – look for a broad, hazy-looking band, almost looking like a band of faint, thin clouds. If you follow the band down to the south, you’ll be looking directly at the heart and center of the galaxy. Just above the southern horizon, look for a single, bright reddish-orange star. This will be Antares (“An-TAHR-ayz”), the “Rival of Mars” (which is what Antares means), in the heart of the constellation Scorpio. If you’re up late enough, the planet Jupiter will be rising in the southeast. Jupiter will appear a creamy white color, and if you’ve got a small telescope or binoculars with you, you might be able to see some of Jupiter’s larger moons, looking like tiny stars on either side of the planet. It was 70 degrees today in Fort Collins, but we’re under a winter storm watch with 5-10″ of snow on the way by Friday. This is otherwise known as “Spring in Colorado.” Here’s another storm that’s just a tad bigger and has been going on for (at least) hundreds of years: the storm at the heart of the Great Red Spot on Jupiter. Check out this report from the European Southern Observatory, which has just obtained some ground-breaking thermal imagery of the largest storm in the solar system: Scientists Get First Look at Weather Inside the Solar System’s Biggest Storm. Comets, asteroids, and craters, oh my! The news is buzzing lately with images of an Earth-sized “scar” in the atmosphere of Jupiter that an amateur astronomer from Australia spotted recently. NASA even oriented the Hubble telescope, which underwent repair in May, to take a look even though it’s not slated to be back online quite yet. The massive scar in Jupiter’s clouds was likely caused by an asteroid or comet. Interestingly, that object was probably only about 50 to 100 miles in diameter. The scar is much, much larger than the object that actually made impact. Why is that? The force of the impact of the object against the gas planet caused debris and what scientists call ejecta to shoot away in all directions from the point of impact. Essentially, the speed and direction of an object (or derivation of momentum with respect to time) at impact influences how big crater will be. In the case of a gas giant planet like Jupiter, we see a scar in the atmospheric gases. The greater the force of impact, the greater the field of debris and ejecta will be. We illustrate this phenomenon here at the Museum in a cool activity we do with our visitors as part of our Virtual Space Community partnership with Space Center Houston. We create a model planetary surface in a pan by layering flour under a thin layer of cocoa powder. By dropping rocks or beads from varying heights into the flour, we can see the size of the debris and ejecta field caused by the impact of our “asteroid” or “comets.” The flour under the cocoa powder shoots out on all directions. We can see it across the surface of our planet and in a “cloud” over our planet. Our atmosphere protects us from most asteroids and comets because they usually burn up in our atmosphere — but some do make it to the surface. We call them meteorites and they are spherical in shape because of the forces acting on them as they travel through the atmosphere rounds off their uneven surfaces. 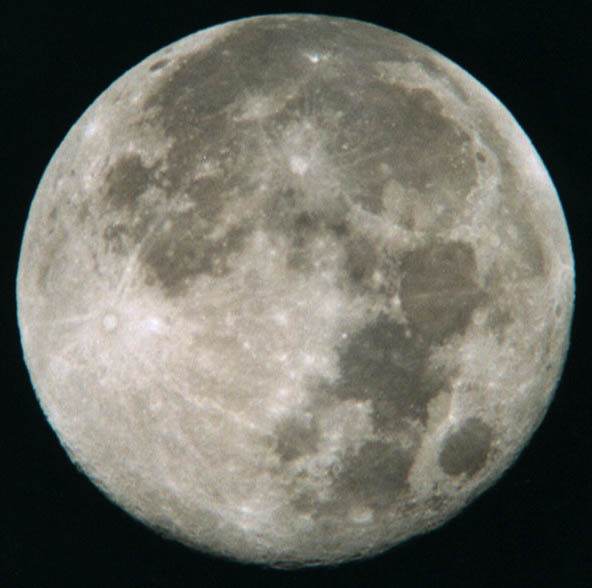 The Earth’s moon, lacking an atmosphere, has been, and will continue to be, impacted by objects of all shapes and sizes. No atmosphere, no rounding. Some night when the moon is visible, take a pair of binoculars and look for the irregularly shaped scars of asteroids and comets that have hit the moon over many millennia.